Teaching is hard work! Not even considering the 30+ personalities in every class that I am expected to keep engaged and on task for 90 minutes straight, there’s a LOT of paper and details to keep track of! 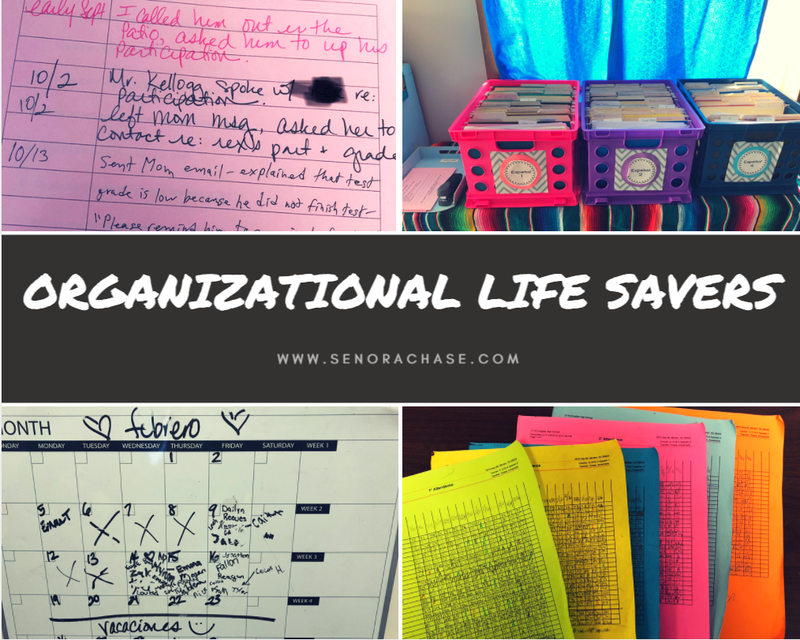 Here are a few strategies and systems I’ve put in place over the past 12 years that help things run smoothly and keep my sanity… So I can focus on loading up my little darlings with lots of comprehensible input. Every student has a folder and this is where my TA files all their graded work. Gone are the days when I would spend 15 minutes running around like a crazy person passing back papers! And when a student leaves a paper behind, I file it into their folder so they can find it when they get back. And absent students’ work magically makes its way into the student folders. I can’t say enough good things about Student Folders…read more about them here! Each kid comes with so much paper! I have a binder full of clear, plastic page protectors and it’s my lifesaver. Each one is dedicated to a student and that’s where I keep their Student Interest Survey (which they fill out on the first day of class), the signature sheet from my syllabus, any IEP or 504 accommodation sheets, and a Parent Contact Log, which I jot notes on whenever I contact a parent. I also file used bathroom passes. (And when I say I file, really I mean my TA files! 🙂 All of these important papers associated with a single student go into 1 page protector, and all the page protectors are organized in a binder by class, in alphabetical order. It also makes it really easy to remove a page protector to take all your documentation on a single student to parent meetings. Man, I have a lot of things to do when my kiddos walk into the door…like ask them the password, greet each one, and get started right away loading them up with all the comprehensible input I can muster. Taking Attendance has always cramped my style. I know they suggest “bell ringers” so the teacher has time to do attendance, but I always felt like those were wasted minutes, and I don’t have any minutes to waste! Last year I changed up my attendance routine and I love it! Now I have a responsible student in each class assigned as the “Attendance Police” who is responsible for taking the clipboard off the front wall, writing in today’s date, and sending it around the classroom for students to initial. Once everyone has initialed, it goes back to the Attendance Police who verifies that everyone in the classroom has initialed, and the students who have no initialed are in fact absent, then she or he puts the clipboard right on top of my keyboard so I can’t miss it. Then, when I have a few minutes, I check the list again (because ultimately it is my responsibility to make sure the attendance is accurate), mark A with a marker on the paper and enter the attendance into my computer. The I return the clipboard to the front of the room, ready for the next class’s Attendance Police to do their job. Pro Tips: They are on bright neon paper so that it catches my attention and each class has an assigned color (which matches their bookmark color for Free Reading!) Only once did I have a student initial an absent students’…. of course I realized it when I was entering attendance because there were more empty seats than absent students. As “punishment”, I made them line up outside and initial as they entered, while I was holding the attendance calendar, verifying each one. It was a huge pain and they had to wait outside freezing…we did that for about 2 weeks before I resumed the usual procedure and there were no more problems. Classroom jobs: I’m not sure which genius introduced Classroom Jobs into the Language Teaching Sphere, but I know the idea has been around for ever. My mama, probably the world’s best elementary teacher, has had Classroom Jobs in her room for the past 30 years. I first heard about them being used in CI classes at Reno NTPRS from Bryce Hedstrom. He has written about classroom jobs here. Basically I love classroom jobs because they make my life easier. I just think of things that need to be done, but that a student can do. Like take care of attendance, see above. Like answer the phone at my desk so I don’t have to stop teaching to answer it. Like erase the board at the end of each class, so it’s ready to go for the next class. Like adjust the thermostat. Like turn off the lights. Like turn on the lights. Like announce birthdays. Like welcome administrators who come in to observe….You get the idea. Here are the job descriptions that I assign. Some jobs are permanent positions, the same student will do the job all year long. Other jobs are temporary, and are associated with the student’s seat (like answering the phone) so that job will change when I assign new seats. I don’t assign all the jobs at once at the beginning of the year, but rather as they become necessary. Classroom jobs are a lifesaver!